The ThOR line is rich with features and options making it the best value of any comparable system on the market. This model is lightweight and small enough to fit in the palm of your hand, yet its rugged and durable. The entire system is built in the USA, utilizing Mil-Spec Lenses that make the ThOR battleworthy for most any mission, operation, or outdoor activity. Each system features a digital menu that gives you a variety of options and adjustments allowing you to customize your system. You can select a number of reticle options as well as choose a reticle color best suited for your specific application. No more black reticles on a black and white screen ThOR features a color OLED display giving you a sharp color reticle every time. Or switch to full color mode and overlay it with either a black, red, blue, white or black reticle depending on the conditions and the environment. Ever have problems with a scope not being able to hold zero The ThOR has no screws or springs that can create targeting errors. With all digital controls, the ThOR will NEVER allow your reticle to move off base. The ThOR Thermal Weapon Scope provides amazing image quality through total darkness, fog, or smoke. Darkness, camouflage or bright lights will not affect the sensitivity of these units. All units have feature E-Zoom to expand your optical magnification. Theyre Ideal for nighttime hunting, force protection, border patrol, police SWAT and special operations. And they feature a video-out connection and cable which will let you capture your nighttime operation on video. These units are priced like no other thermal devices in their class as much as half of what you would expect to pay! No other product is comparable in value or price. 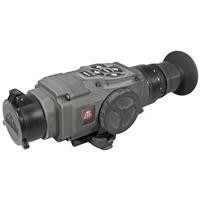 The ATN ThOR functions equally well as a weapon scope or a handheld viewer. Once you experience Digital Thermal you may not want to use anything else again!